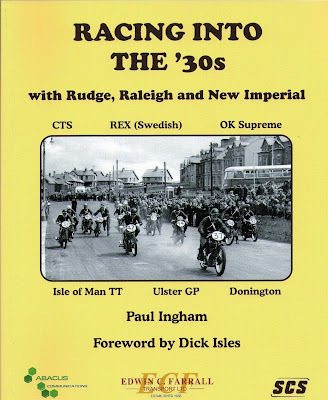 -SG- Apart from being a collector of interesting bikes, Paul Ingham has written several books and the latest is 'Racing into the '30s.' This includes many hitherto unpublished photos of the thirties racing activities of Excelsior (for which Paul has a special interest), New Imperial, Rudge, Raleigh etc. 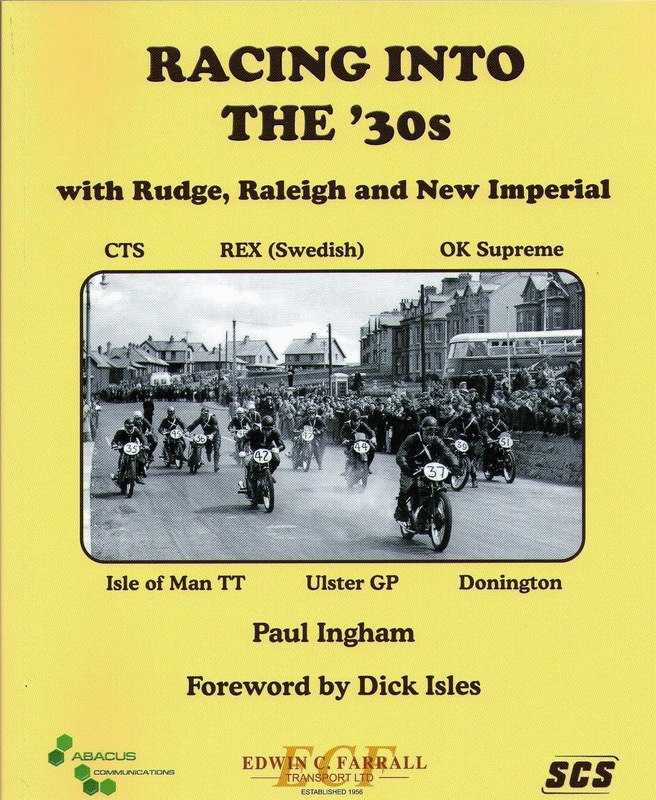 For those who take an interest in non-Norton matters, the book is available from Paul at www.excelsior-manxman.co.uk. You may wonder what this has to do with the vintagenorton.com website and the answer is quite simple. In the course of his researches Paul gathered quite a few interesting Norton photographs which he has kindly passed on to me and which will appear shortly. In addition, he has introduced me to Allan Sorensen, son of the late S A Sorensen (probably Denmark's best known road racer from the thirties and forties). Sorensen rode as a semi works rider for Excelsior and had excellent relations with the Norton factory as well. Norton photos from Allan will also follow in due course. 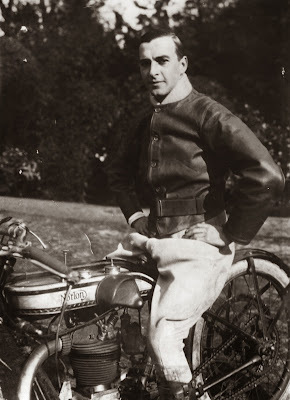 To start with we have a 1925 photo of sprinter Len Slater - from Sheffield - sitting on his early Model 18. 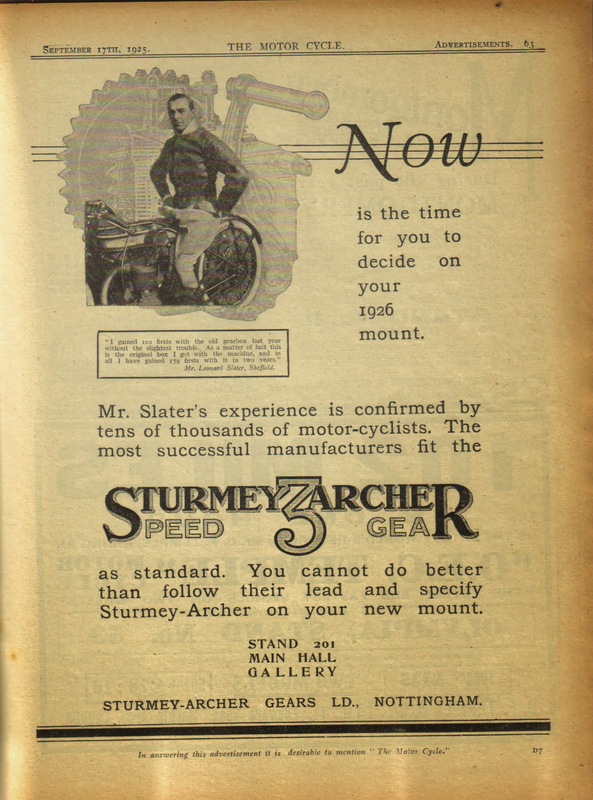 The photo was used in Sturmey Archer adverts, one of which is below. 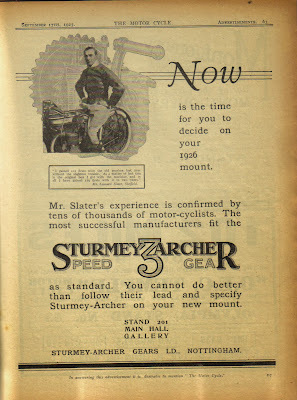 It is interesting to note the vast number of awards Len amassed in two years (see Len's statement in the advert) - and although he may have gained more than one award at any given event, it does show the great number of speed events which took place in the first half of the twenties. Many of these were on public roads, a situation which came to a halt in early 1925 following an accident at Kop Hill Climb, near Prince's Risborough. A young and seemingly rather inexperienced Bugatti driver managed to break an errant spectator's leg (crowd control was non-existant). Len Slater's bike surfaced about thirty years ago - or what was left of it, as the engine was missing - and was rebuilt by the late Bob Swires of Ripon. In so doing he updated it by fitting an eight inch Enfield rear hub which he bought from me. Who has it now, I do not know.